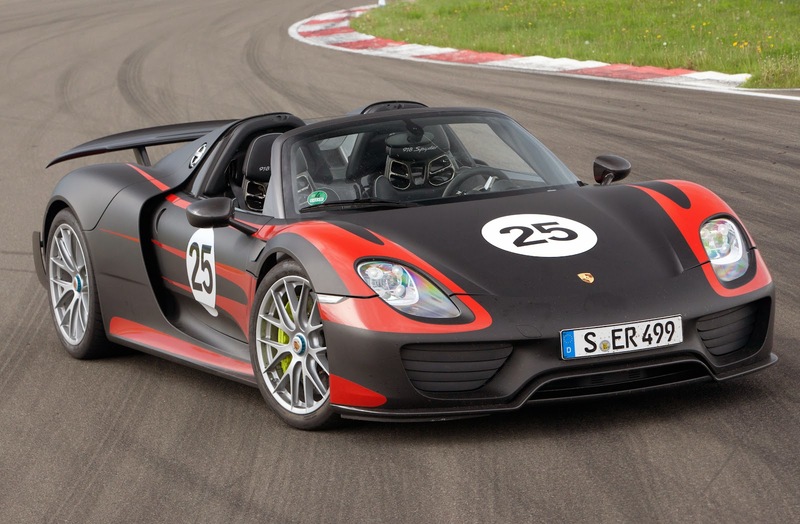 Porsche have announced full details of their new supercar, the 918 Spyder. 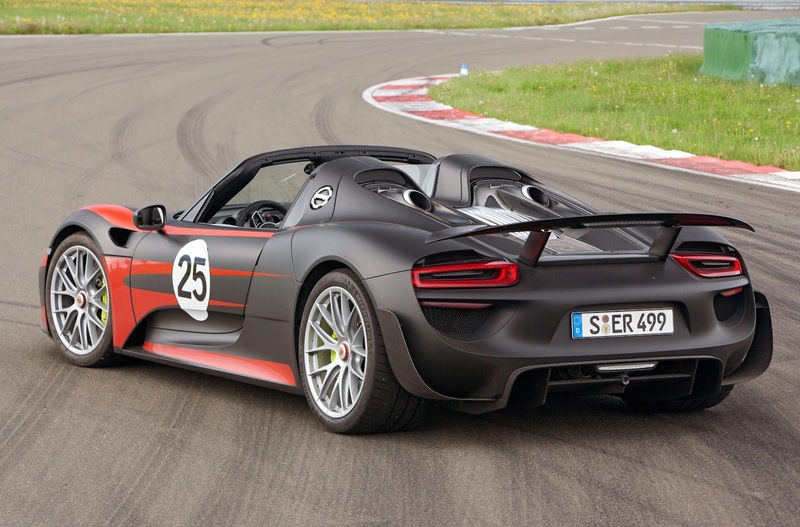 Unfortunately they chose the day of the McLaren Honda announcement to launch the 918, which overshadowed everything else in the car world - including the first true Porsche supercar since the Carrera GT in 2007. We already know quite a lot about the Porsche 918 Spyder having seen photos, read specs and having ridden in one around the Bahrain F1 circuit last month. Enough of the speculation and occasional snippets of information. This is the real deal. 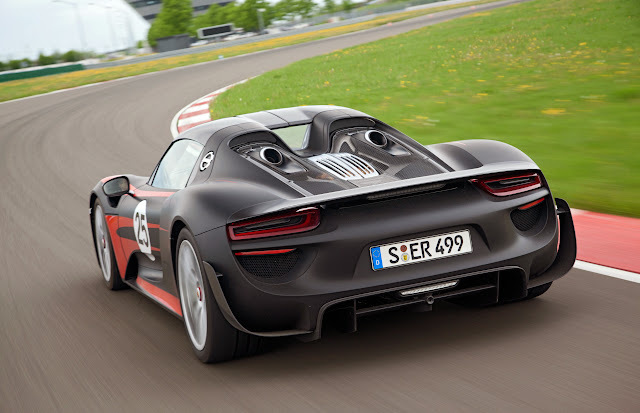 The Porsche 918 Spyder is a hybrid supercar that weighs 1640kg in 'Weissach' trim - Weissach is the home to Porsche Engineering which is Porsche's external design and engineering unit that serves both Porsche and anyone else who pays them. In the 918 Spyder the Weissach package increases the use of carbon fibre (and adds a sprinkling of Alcantara) to lighten the base car. All load bearing components are made from carbon reinforced polymer and are located as low and centrally mounted as possible, giving a 43% front and 57% rear weight distribution. The battery is housed right behind the driver with the engine behind that. The 4.6 litre, V8 petrol engine produces 612hp and is derived from the unit in the RS Spyder race car. It can rev to 9150rpm. At the rear, and directly coupled to the V8 is a 115kW electric engine, which can be decoupled if necessary. At the front axle is a 95kW electric motor - with no mechanical link to the V8 or rear electric motor - that delivers power to the front wheels. Combined power is 887hp and 590lb ft of torque. The power is delivered by a 7-speed PDK gearbox. The braking system combines the regenerative hybrid system with ceramic discs. All this power and clever design make for some astounding stats. Top speed is 211mph. 0-62mph takes 2.8 seconds. 0-124mph takes 7.9 seconds. 0-186mph takes 23 seconds. Fuel consumption is 86mpg and CO2 emissions are 79 g/km! 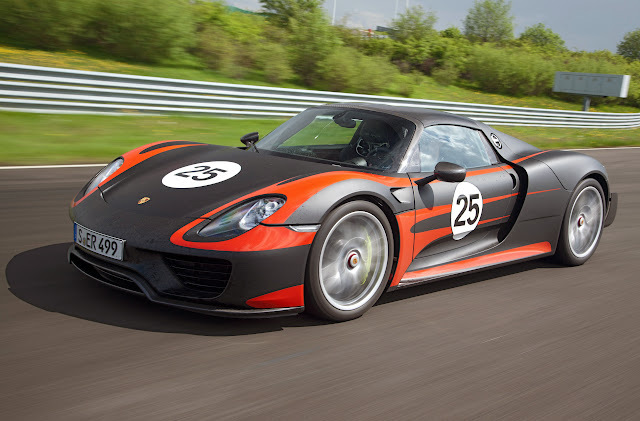 The Porsche 918 Spyder costs €781,155 (£658,425). 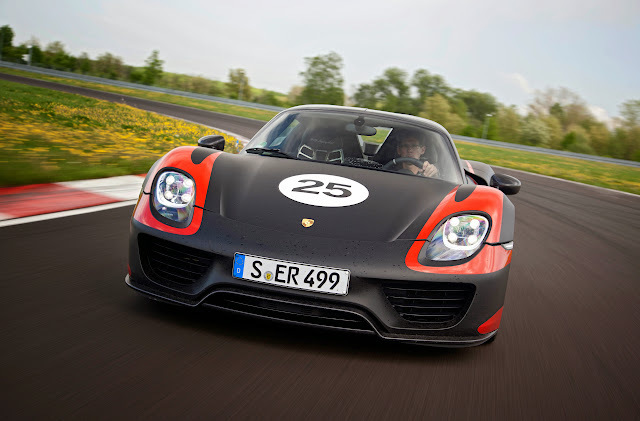 The Weissach version costs €853,155 (£719,112). It comes with a 4 year warranty - and a 7 year battery warranty. 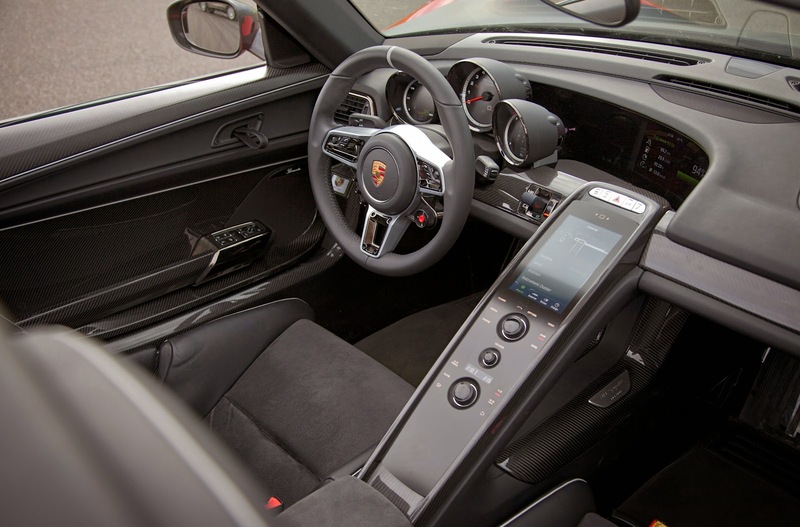 The interior seems pretty normal and comfortable for a stripped out, super-fast supercar - no more basic or less well equipped than a Cayman R. The front lights too are refreshingly normal. Porsche have obviously opted to spend the budget on the areas that count - refinement, ride and powertrain - rather than rinky-dink lights that no-one cares about. Porsche promise that this car will serve as the launchpad from which future Porsches will be derived. In the not too distant future all Porsche models will be available with hybrid engines. If this means we can have the best of both worlds - performance and environmental credentials - then this is a good thing.